Fat Train: Where Has This Woody Allen Been? Where Has This Woody Allen Been? Midnight in Paris is simply magical. Over the last week and a half I have seen three fantastic movies, and each one has rated above the last for me. To be fair, if it weren't for the lens flares, I probably would have kept Super 8 above Green Lantern, but the lens flares were there and they were super (no pun intended) annoying. 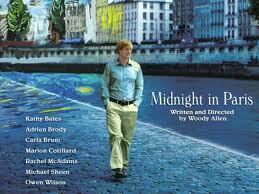 Tonight I saw Woody Allen's latest film, Midnight in Paris, starring Owen Wilson as neurotic writer Gil Pender. My friend Caitlin (who I would have to describe as relevant, revelatory, and paradoxically juxtaposed) and I went to see the film, not at all sure what to expect, and honestly, that is the way to view this film. The less you know going in, the more magical and delightful the film will be, so I'm not going to say too much. I loved Super 8, and part of the reason was that it inspired a sense of nostalgia for film-making that we don't see as often anymore, particularly the innocence and wonder that Spielberg's films used to inspire. Woody Allen was a similar filmmaker once upon a time. His movies were imbibed with a magic and realism (another paradoxical juxtaposition I suppose) that could transport you into the film you were watching, and that experience is rare in films these days. And, honestly, it has been rare in a Woody Allen movie in quite some time. This movie, however, brings back that feeling, and recaptures a magic that Woody Allen hasn't, in my opinion, provided in quite some time. Both this film, Midnight in Paris, and Super 8 provide a nostalgia for the way that movies used to be, both center on an idea of a time period passed that we long to revisit and want to try to connect with in some way. If anything negative can be said about Super 8 (besides the annoying lens flares), it would be that while that nostalgia is present and magical, there isn't really anything that original beyond it. It hearkens back beautifully to films and themes of the past, without having anything new or original to say, which is saying something in and of itself, and I really don't mean to disparage Super 8 in anyway. What it did worked for me and I truly loved the film. Midnight in Paris, on the other hand, embraces the nostalgia, and recalls the feeling of the golden ages of the past and makes you remember the way film (and Woody Allen films in particular) used to be, but at the same time it is a completely original movie that feels like something new and refreshing. If you categorize it as romantic comedy (and I'm not really sure that is the classification I would use, I would rather refuse to try to box it in to any one genre) then it is unquestionably the best romantic comedy I have ever seen. Ultimately, I think it will be placed amongst my favorite films of all time, and I find it hard to imagine that it will be topped by any other film this year as it is the best film that I have seen since 2006 when The Fountain and The Children of Men came out. Interestingly enough, Woody Allen apparently tried to get this film made in 2006, but was unable to do it cost effectively. Until Next Time, I believe it was worth the wait, as it makes the present more pleasant while acknowledging the nostalgia of the past.